Have you ever wanted to tour a historic movie palace? One of those elaborately ornate monuments to cinema constructed during the Golden Age of American movie theaters, back in the ‘20s and ‘30s? Well, I have, and luckily for me I live not very far from one of the most spectacular of them all, the Paramount Theatre in Oakland, CA, a theater that hosts public tours twice monthly. 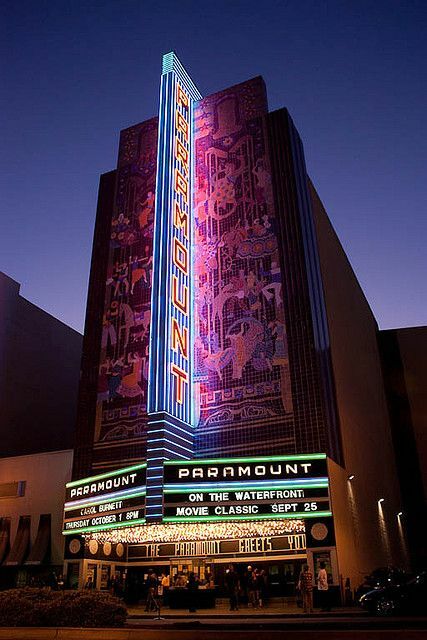 Considered an Art Deco masterpiece, the Paramount was at one time the largest theater on the West Coast. It’s opening night, in December 1931, featured Kay Francis, star of the theater’s first screening, The False Madonna, along with the film’s supporting cast, and scores of other luminaries, including the Governor of California. But this first blush of glory was short-lived; the theater closed its doors for the first time in June 1932, unable to meet its weekly $27,000+ in operating costs. The Paramount re-opened under new management within a year, but no longer featured stage shows, an orchestra, or light fixtures with full sets of working bulbs. Over the next several decades the Paramount weathered periods of decline and resurgence, but today stands resurrected, the anchor of Oakland’s thriving Uptown neighborhood. Because we wanted to find out more about the Paramount’s nearly 90-years of history and get a behind-the-scenes look at this fabulously restored showplace, a friend and I attended a tour in July, a 2-hour excursion that led us into the past, through just about every nook and cranny, filled our heads with numberless historical and architectural facts, and ended with a spectacular light show in the theater’s cavernous auditorium. It was a sunny Saturday morning, a beautiful summer day, so perfect that I didn’t expect much of a crowd for the tour. I was wrong. There were at least 30 people queued up in the lobby of the Paramount’s box office entrance when we arrived, and more would come. Once assembled, we were welcomed by our tour guides, Erin Mahoney and Ken Marquis, both of whom possess not only vast knowledge but also great enthusiasm and affection for the Paramount. 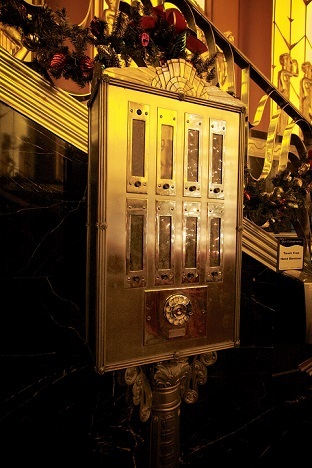 We learned that acclaimed San Francisco architect Timothy Pflueger designed and built the Paramount in 1930 - 1931. 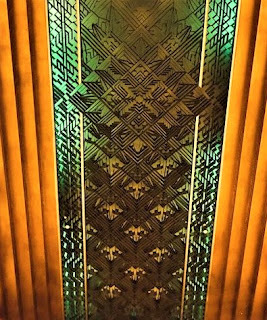 Pflueger is also responsible for the design of the still very active Castro Theatre in San Francisco as well as many other landmark structures in that city, among them the extraordinary Pacific Coast Stock Exchange building (now a fitness center) and the 450 Sutter medical building. We also learned that though the Paramount is celebrated as an Art Deco jewel, Pflueger didn't conceive the theater as "Art Deco"...so many interesting facts. As we made our way up and through the Paramount’s mezzanine and balcony areas, oohing and aahing at everything from floor to ceiling, Erin revealed that she is more than a tour guide for the theater, she also appears as “Miss Guided,” spinner of the Deco-Win wheel on classic film nights at the Paramount. My friend and I were the only ones in our tour group who had seen Miss Guided work her magic onstage. My own first visit to the Oakland Paramount came in 1979 when I attended a preview screening there of Werner Herzog’s Nosferatu the Vampyre. I knew nothing of the Paramount when I stepped into its incredible grand lobby then, but it was obvious the theater had been painstakingly restored at some point and carefully maintained since, for it looked brand-new. And it was stunning. Many years later, in this century, I learned that the Paramount, along with presenting everything “from symphony, to soul, to stand-up comedy…from ballet, to blues, to Broadway shows,” also screened classic films one night a month and that’s when I made my return to the Paramount. Films like Hitchcock’s Vertigo, Donen’s Charade, Hitchcock’s Notorious, Curtiz’s Casablanca, and Huston’s The Maltese Falcon are almost always greeted with a packed house and always feature a musical interlude via the Mighty Wurlitzer, a Warner Bros. cartoon, an old newsreel that features San Francisco or Oakland, a preview-of-coming-attractions reel and…Deco-Win, a chance to win one of several prizes given away before the movie of the night screens. All of this for only $5. And Miss Guided, a glamorous lady decked out in gown, gloves, and jewels, always spins the Deco-Win wheel with style. At the end of our tour, I approached Erin aka/Miss Guided, and asked the ebullient tour guide/show host if she would be interested in an interview by e-mail and she agreed. 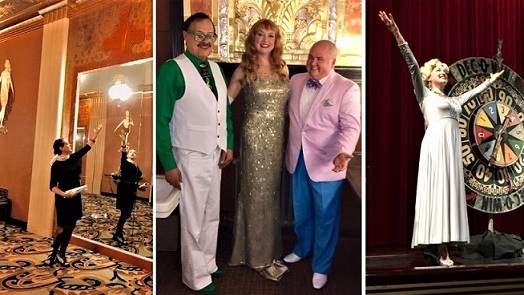 Read on, to find out more about the theater’s past and present, how Erin came to be a Paramount tour guide and spin-to-win icon, about classic film night and more at the Paramount Theater, “always the best show in town." Lady Eve: How and why did you initially become involved with the Oakland Paramount? Erin: I first came to know the Paramount through the Art Deco Society of California, they had an Art Deco ball in the lobby. I was working as a volunteer for them for 12 years, as a chorus dancer in their troupe called “The Deco Belles.” Friends pointed out special touches with the design and architecture. Soon I realized how lucky we are to get to enjoy this gem of a place! Lady Eve: How long have you been leading the tours? What's most fun about being a Paramount tour guide? Erin: I have been doing the public and private tours since April 2012. They had asked if I knew anyone who might be good at it and I said, “I would like to do it!” I thought it would be a good way to get better at public speaking and feeling comfortable in front of an audience. It’s definitely changed me, I used to feel very nervous in front of a group but now I can speak loud and strong and, magically, people listen. To be honest, I also wanted to be a tour guide so I could dig my heels in deeper and be a valued member of the Paramount team - making it harder to replace me as game show host, once I showed my undying devotion and reliability. It’s a big pleasure to share the theater as a tour guide and game show host. I put a lot of energy into it because I live the theater and I think if people have a great experience, they will remember it, tell others, and come back for more! This will help the theater live on! Lady Eve: Is there a particular aspect of the Paramount's design and/or history that interests you most? Erin: It seems like a 2-hour tour is long enough to cover all the important things about the history and decoration of such a grand movie palace, but there is so much more to share. I try to speak quickly to keep people’s attention and also squeeze in as much information as possible. I especially like to focus on the decoration and art of the theater. I tell people to look online if they want more information about the finances or politics of the Paramount changing hands over the years. I like to say, “Today I am going to focus on things that you can see and touch.” But there is really so much more to discover about this special place. Lady Eve: What would you like others to be most aware of about the Paramount? Erin: Most stars everyone knows and loves perform at the Paramount when they tour [coming soon: Christina Aguilera, Carol Burnett]. Many people pass the theater by and don’t realize how diverse the line-up of entertainment is. There is really something here for everyone. I especially love to point out the programs I am associated with, the public tours - first and 3rd Saturday of each month, and also the classic movie night, once a month - both are a lot of entertainment for only $5. There is so much going on at the Paramount, people should sign up for the email list of events. I love the speaker series, the naturalization ceremony, and all kinds of concerts. It’s elaborately decorated at Christmas-time and there is always a sweet version of the ballet, The Nutcracker. I have seen the symphony and also some corporate events, where they rent out the theater for the night. Lady Eve: How long have you been "Miss Guided" for the Paramount’s classic film nights? Erin: Two of my “sister Belles” [from the “Deco Belles”] were alternating doing the spin-to-win game and asked if I could fill in sometime. Both girls said, “When you want it, it’s yours!” I guess they had other exciting things to do on Friday night, but not me!! 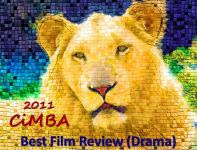 Nothing is more fun for me than to be a star of the show in such a grand movie palace. I always look forward to it and I think the audience can feel my enthusiasm. Collecting vintage gowns, platform shoes and costume jewelry has been a long-time hobby of mine, especially emulating the glamorous Hollywood years. It’s delightful to have a place to share creative expression with these accessories. Dressing up comes as second nature for me, enough that it’s kind of become my main career! I have been doing the Deco-Win game since 2009. Of course, it’s the same routine every time, but we make it special with new outfits, new moves, and spontaneous jokes. I feel like I am a physical comedian, communicating without words, using body language and gestures. I am especially interested in this kind of communication that crosses boundaries, universally understandable to any age, gender, or nationality. My stage name, Miss Guided, was made up by my husband. We both thought it was fun, spirited and suits me well. By day I am a teacher and tour guide and by night, a rowdy showgirl. Sometimes people don’t remember my stage name and call me all kinds of strange things, like Miss Direction or Mischievous!! I just answer to all!! Not sure if the audience realizes it, but I actually put a lot of thought into styling the game show outfits for classic movie night. For example - for Singin’ in the Rain I wore silver sequin gown, all covered in little drops! Or, for Pretty Woman a red dress like the one she wears to the opera, in the movie. And for Dumbo, I found a gown with a special fabric with lots of wrinkles! I wore big clod-hopper chunky platforms like elephant feet and styled my hair fluffy on the sides like big ears! Lady Eve: What is your favorite film that has been shown on classic film night? Erin: A couple of my favorite movies that we show for classic movie night are Casablanca and The Wizard of Oz. Both of these draw a big crowd, selling out almost all the 3,000 seats. Having a full house is definitely exciting. For the Casablanca opening, I like to wear a belly dancer’s sword balanced on my head and we say, “it’s fun and games ‘til someone gets an eye poked out!” I have a perfect Marchesa white silk chiffon gown with heavy bullion type beading in swirls at the waist. It’s glorious, exotic and over the top, just like the decadent Paramount Theatre itself. 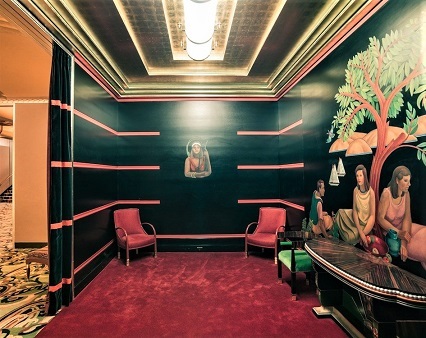 Lady Eve: Would you elaborate a bit on the "Green Mansions" design theme of the theater's grand lobby interior? Has management considered screening the '50s film version of Green Mansions (they really should - with you explaining the connection)? Grand lobby "silver fin ceiling in green"
Erin: The book Green Mansions [by William Henry Hudson, 1904] is credited as the design inspiration for the grand lobby. The terra-cotta pillars represent tree trunks and the amber windows remind us of the sunlight coming through the trees. The silver fin ceiling in green is reminiscent of the leafy canapé of the forest above. Then we have the waterfall in 12 layers of etched and frosted glass. Finally, we have the black marble “cave” and climb the “mountain” to get to the upper mezzanine [see the two photos of the grand lobby area at the beginning of this post]. I would love it if we could play the classic movie Green Mansions, with Audrey Hepburn. We have not played this movie so far. There are two issues - it’s not so easy to rent actual films (a lot of people don’t realize we are playing actual films, which are hard to get and must have a union technician to play the reels properly). Also, it’s important to show films that have a draw, to bring in more people, and this movie is fairly unknown. My thanks to Erin for so graciously and generously agreeing to this interview and for responding with such enthusiasm, and thanks also to her and to Ken Marquis and the Paramount management for an enchanting trip through Oakland’s historic and architectural treasure. I'll be back for another tour and many more classic film nights. 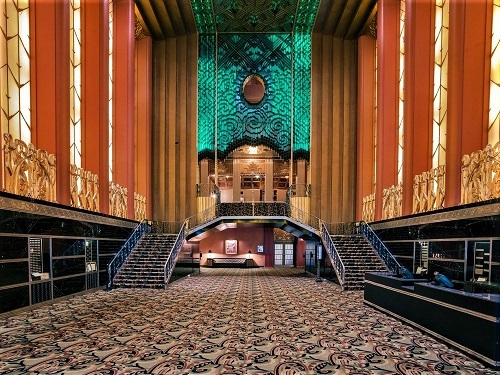 For more on the history and design of the Oakland Paramount, click here. 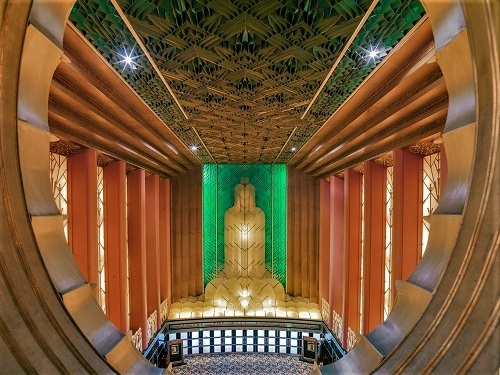 To check the Oakland Paramount’s public tour schedule, click here. For the Oakland Paramount’s calendar of events, click here. Great to hear from you, Paramount Theatre Team, please DO share this post on your social media outlets, I'm honored! What stunning interiors! 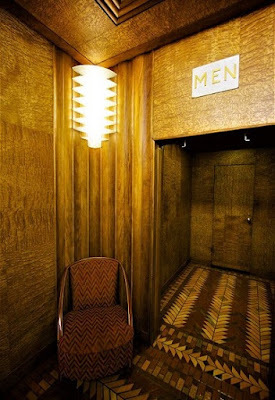 Have been to the Paramount several times, but it was great to see the beautifully lit rooms in these photos - and of course the ladies smoking lounge, which I've never viewed. Talk about lightyears from all the modern shopping mall cineplexes, etc. The Paramount really turns movie going into a heightened aesthetic experience. I can't imagine how weekly expenses in 1932 could add up to $27,000 - that was right during the Depression and that had to be an astronomical figure back then. How could they ever survive? You should take the tour, MCB, you'll get an idea how operating the Paramount might've been outrageously expensive, even in 1932. The staffing and electricity bills alone must've been incredible. I love the Paramount and am so happy it survived hard times to go on to become the important cultural center it is now - not to mention both a California and US historical landmark. Thanks for this lovely and fascinating look at the Paramount. A great post, and I love the interview with Miss Guided. What a marvelous theater. So glad you enjoyed this piece Jacqueline. Should you visit the Bay Area, this is one tour that is absolutely worth taking. And "Miss Guided" is delightful. A wonderful post. So many of these old theaters have been destroyed. I know in NYC, all of the Broadway movies theaters are long gone. I think a theater in Harlem has been turned into a church. The former Loew's Kings theater in Brooklyn, after years of being closed and neglected was finally renovated and turned into a live performance venue. In Tampa, there is the Tampa theater which goes back to the 1920's and does a combination of films and live performance and has been designated a historic landmark. It's a beautiful theater and they do tours also, though we have never taken advantage of that. I second Jacqueline's comment on the interview. It is heartbreaking that the majority of the grand old movie theaters didn't survive, but those that did - like the Paramount - are a testament to the amazing amount of creativity, artistry and craftsmanship that went into their conception and construction. John, I hope this blog post inspires you to take the tour of the Tampa theater you mentioned - and post the photos you take! 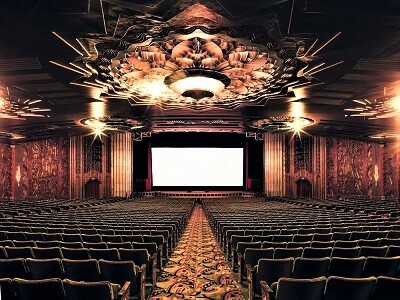 How great that this magnificent theater was never demolished and it is available for tours now in all its glory. Thanks for this virtual tour and history Patty. I've never been there, but I've admired some other movie palaces in L.A and other cities. And I'm a big Art Deco fan. Thanks for this great post. The restoration of the Paramount was no small feat, Christian. It was in poor shape by the early '70s due to neglect, vandalism and theft. 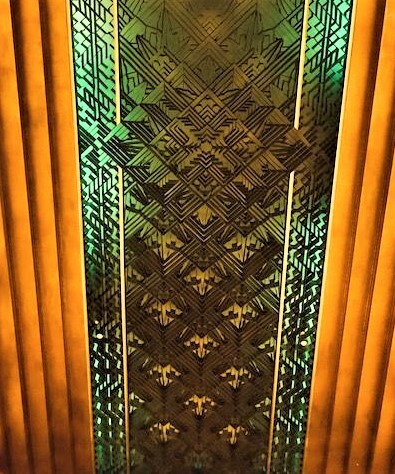 I want to give a nod to David Boysel, the artist/restorer who oversees most of the Paramount's ongoing care and repair. The tour made me appreciate all that goes into maintaining these incredible movie palaces (I'm thinking of LA's Chinese and Egyptian, too).